The target group of the Panasonic GD 67 is the same as of GD75, in other words it is the phone of the middle class aimed to young people. The evidence is the possibility to change the picture under the rear part of the phone - rather unusual feature. You can just cut the new picture and lay it under transparent plastic. It's obvious that it can be a photo, press-cutting or anything else, it depends on your imagination, there are no limits. But unfortunately, there are no other opportunities to change the design of the phone. The phone is available in two colours. Only the rim around the display and the cover, which hides the system connector, are different (Purple or Blue). The main part of the phone is silver coloured in both cases, the functional keys are transparent. It seemed to us that such colour combinations look really nice. 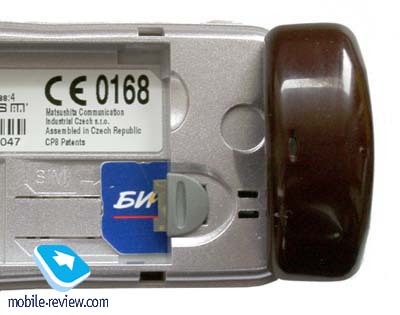 The phone is handy, its weight is 81 g. and dimensions are 109 x 45 x 29 mm. The rear part of the phone scratches a little, probably because of not very strong fixation. On the contrary, the cover of the system connector has no backlash, the accidental opening is almost impossible. The cover is fixed by the special slider holders and it can be easily opened. 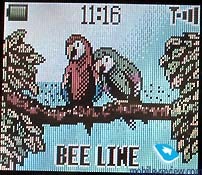 Let's turn to the most interesting part of the phone - to the screen The display of GD67 shows up to 256 colours, its resolution is of 101 x 80 pixels what allows to display up to 5 text lines and tips to the soft-keys. 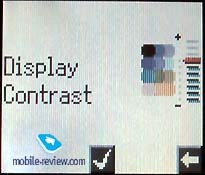 As for me, the quality of the picture on the screen is similar to SonyEricsson T300 or T68. Screen savers - animated pictures, can be setup on the standby mode. All downloaded pictures can be wallpapers. 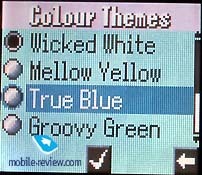 Of course, traditionally for the phones with the colour screen, you can change colour themes of the menu, up to 6 kinds of palettes are offered here. 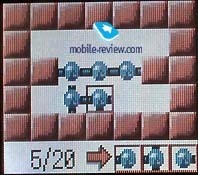 Joystick is placed under the screen, it not only moves in 4 directions but also responds to pressures as OK-key. There are no problems with moving through the menu, joystick is convenient and works well. There are doubled- keys on each side of it, reject key and send key are combined with soft-keys in this model. Alphanumeric keys are small and not very comfortable, though they are well-spaced. You should put your fingers accurate, while pressing the buttons by the thumb you feel the neighbouring keys but the case of accidental pressing is impossible. 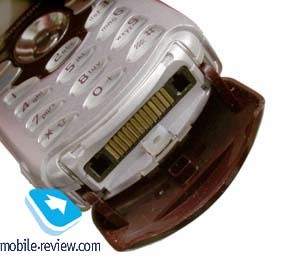 The handset has a lithium-ion battery of 690 mAh capacity. The manufacturer declares that it can provide 1.5-6.5 hours of talk time and 60-90 hours of standby time. In reality the phone worked 2 days in case of 20 minutes of talking and 40 minutes of using other applications. The time of full re-charging was a little bit more than 1.5 hours. In our opinion the autonomy of this phone is comparable to Panasonic GD75. Press joystick to access a menu. The menu structure doesn't have considerable changes and resembles the previous models. 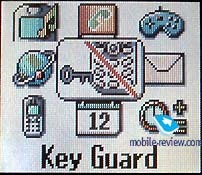 There are 9 menu items as before, the central one is a keypad lock by default. It's enough to press joystick three times to lock and unlock the keypad. You can lock the keypad simultaneously if you hold the joystick and wait a few seconds, then you'll need only one additional touch to confirm the locking. There is a shortcut number navigation in this model to quick access to the desired menu items. Now let's turn to the main features of the phone. The quality of different menu localization is great. Phonebook. You can store up to 100 contacts in this phonebook and only one phone number can be added to one name. 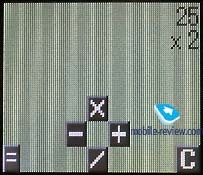 The contacts from the phone memory and SIM-card memory can be showed simultaneously in one list. 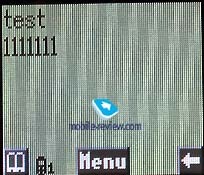 The peculiarity is that only one phone number and one name are displayed at once, you can't view all the list, though the display capabilities allow to do it. There is search by the first letter in this phone. Any contact can be associated to one of the 9 caller groups or left without it (this category is also available). You can also to use voice dial for up to 10 phone numbers in this model. Messages. The phone capabilities are traditional, there are templates which you can create, outbox and inbox folders. 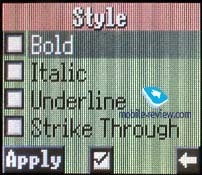 It's interesting that you can choose a font style, size and alignment while creating a message. These capabilities are available as the phone supports EMS standard, you can also include sounds and pictures in any message. 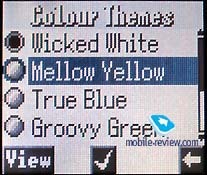 Using the imagination is reasonable only if you are sure that the receiver has the phone, which supports different fonts. In the other case it is just a waste of time. Group messages and SMS Chat are also supported by this handset. Organizer. 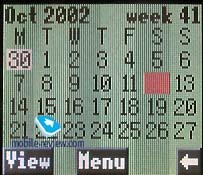 The calendar displays 4 weeks, you can go to any date you like. 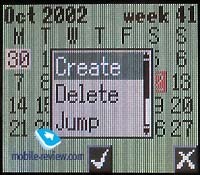 If you create a reminder, you can not only make a commentary, but also set a repeat time and select any of the ringing tones. Up to 100 notes can be kept in this organizer. The unique possibility is that you can point weekends and holidays by yourself and they can be different from the generally accepted. Applications. Here you can find such feature as dictaphone, which enables to record up to 14 seconds of talking (only one record). The phone doesn't warn you about the presence of the record in memory, so, accidentally you can delete the previous one. 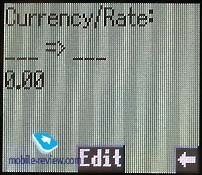 Calculator and currency converter, and autopower timer are also placed here. Moreover, the user can set up to 4 alarm-clocks, even recurrent. Games. There are two games - Atum and Kimang here. The first game demands applying your logics and attention. You should assemble atoms from the blocks. 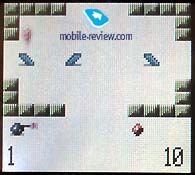 The second game is also logical, you should direct the balls in the holes with a help of traps. Both games are for those, who, like different kinds of puzzles. WAP. There is a wap-browser in version 1.2.1 in the phone, it works correctly. We can add that the availability of GPRS (4+1) makes the viewing of wap-pages not so expensive and more pleasing. Personalization. 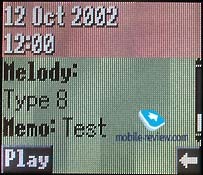 You can select the ring volume, ringing tone (up to 22) or create your own melody in the composer editor (without stave) in this menu. 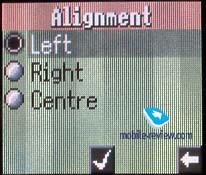 All display settings, the settings for silent mode (can be activated by one touch) are also placed here. The phone is handy, but the colour screen is typical for the phones of this class, the information is not highly visible in the sunny weather. 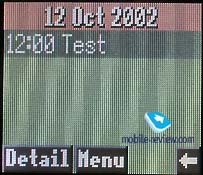 The main rival model of Panasonic GD67 would be most likely SonyEricsson T300. Both phones are launching approximately at the same time, but Panasonic would be a little bit cheaper. An expected price is 250-270$. 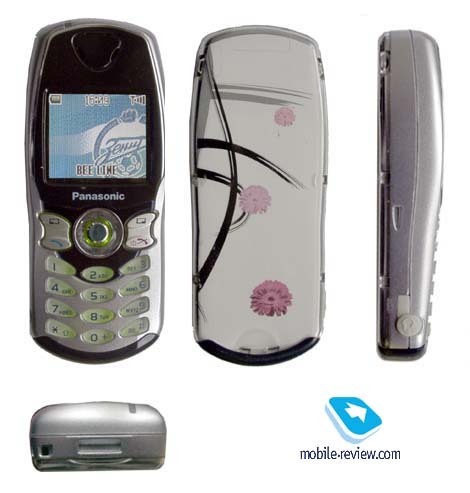 Panasonic GD67 is a logical continuation of Panasonic phone line, an evolution of GD76. The phone would like those who prefer Panasonic to other manufacturers, the phone doesn't have big shortcomings and the realization of one or another features is only the question of taste.